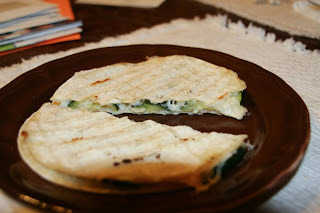 Mama Me Gluten Free: Zucchini "Panini"
If you ignore the homework mess in the upper left of this photo and forgive the lighting, you'll discover a delicious, quick and super-simple meal to serve on these oh-so-busy school nights. I call it zucchini "panini." Corn tortillas, zucchini, white onions, mozzarella, salt and pepper and about 20 minutes from start to finish for five of these yummies. My husband and daughters got me this Cuisinart Griddler for Mother's Day this last year. While I'd been eyeing the appliance for a few years, I had hesitations about it being just that: Another appliance that gets pulled out for use a few times a year and takes up space the rest of the time. Boy, was I wrong. With the exception of my mixer, the coffee maker and my blender, it probably gets used more any other small appliance in my kitchen. We even make our fresh eggs on it in the morning, sandwiching them together between the flat side of the plates for about a minute or two, and we have "fried" eggs without frying them. This griddler is what I make the zucchini paninis on. Place panini grill plates into griddler and heat on grill setting at medium/high. If when you begin to cook, the grill marks don't start to brown the vegetables within a couple of minutes, turn the heat to high. Cut onion in half and slice it. Place slices onto grill, close and cook for a couple of minutes. While onion is cooking, cut up zucchini. Remove onions and place on a plate, then put the zucchini slices onto grill, close and cook for two or three minutes. Remove and place on plate. 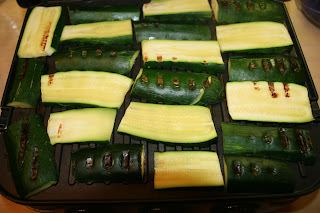 On one corn tortilla, sprinkle a small handful of mozzarella onto surface, then top with three or four zucchini slices. Top with several onion slices, then grind some sea salt over the vegetables and follow with a dash or two of Italian pepper. Sprinkle more mozzarella over vegetables and top with another corn tortilla. Repeat. Place the two "sandwiches" on the grill and close the plates, cooking for a few minutes until the tortilla surface has crisped up and cheese is melting well. Continue repeating until you have enough. Slice panini in half, or quarters.This recipe will make five "paninis."